Although Lee Kit’s work seems, on the surface, to deal with everyday objects, these things actually tend to serve as material support for his private emotions and as backdrop for projected illustrations. These objects seem at a distant remove from the emotional gravitas of the artist, and have almost nothing to do with his fundamental critique of the world at large. For viewers, Lee’s work is often an exercise in functionless formalism. Joyce Ho, by contrast, despite displaying a vigorous extroversion, paradoxically attempts to serve as a hidden viewer, unhidden and unheralded. This approach is apparent from her sculpture of a wrinkled pillow. 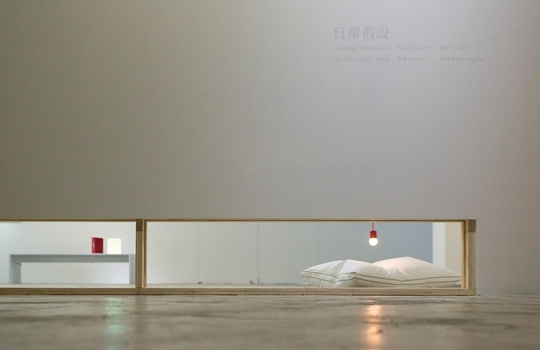 By recreating a pillow illuminated by a light bulb hung high above, viewers are drawn to touch the sculpture, and the long-gone tension of the moment of creation reappears in the form of the hanging light bulb. It is as if the artist were hiding in the dark, manipulating the light bulb and, with it, the mood of the viewer. Lee Kit produces a consistent level of work that will leave viewers shaken and unsteady on their feet in quiet contemplation, while the work of Joyce Ho nimbly moves through the spaces between Lee’s work and the conceptual goals of the exhibition. In turn, the gallery seems to have abandoned subjective language, instead taking Ho’s personal space and physical objects as a jumping off point to instill a growing sense of intimacy the further one moves into the space. This feeling begins from the moment one enters the elevator leading to the space. Moving through the exhibition’s linguistic space, finally arriving at Lee’s work is liking passing across a Möbius strip, unconsciously arriving back where we started. The gnawing language of artists serves to remind viewers: this is nothing more than an everyday experiment.